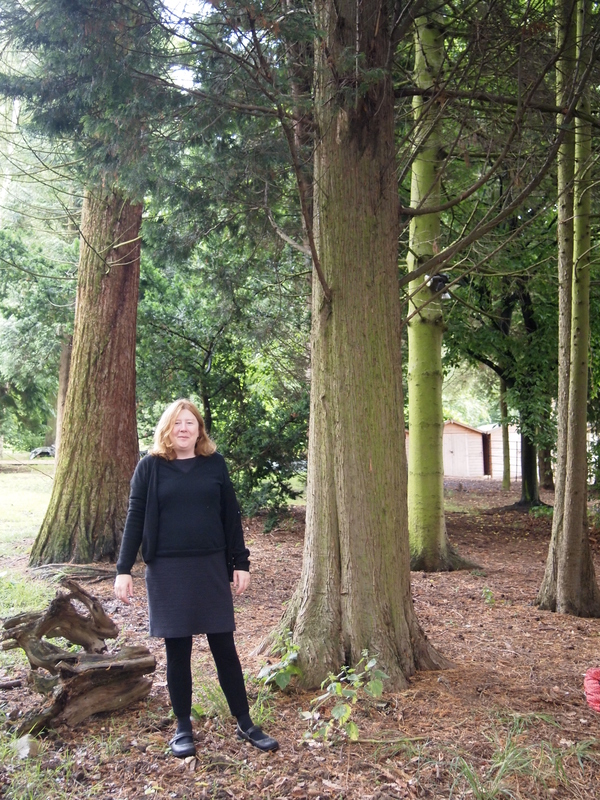 I recently finished a summer research residency at the Yorkshire Sculpture Park (YSP) where I have produced a new sound installation, which is on exhibition there for the next year. 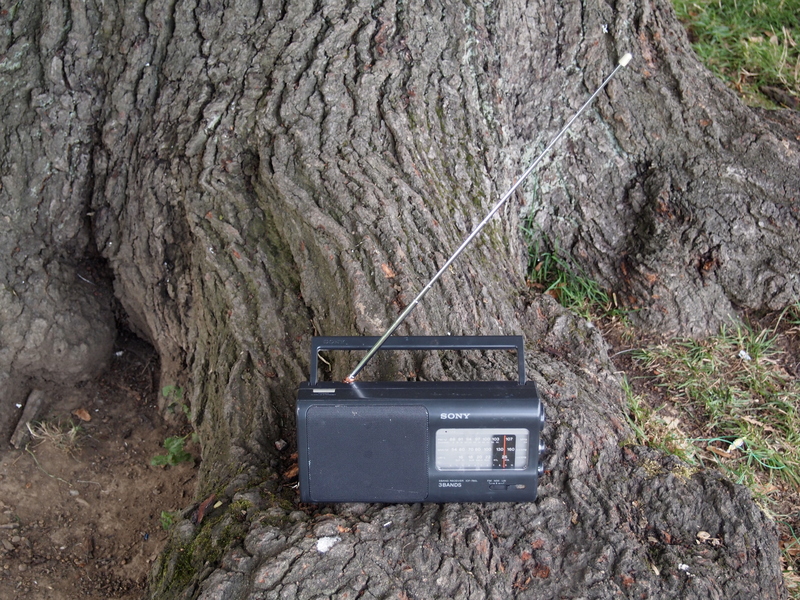 Tree Radio which has has transformed an oak tree at the Sculpture Park into a micro radio station. 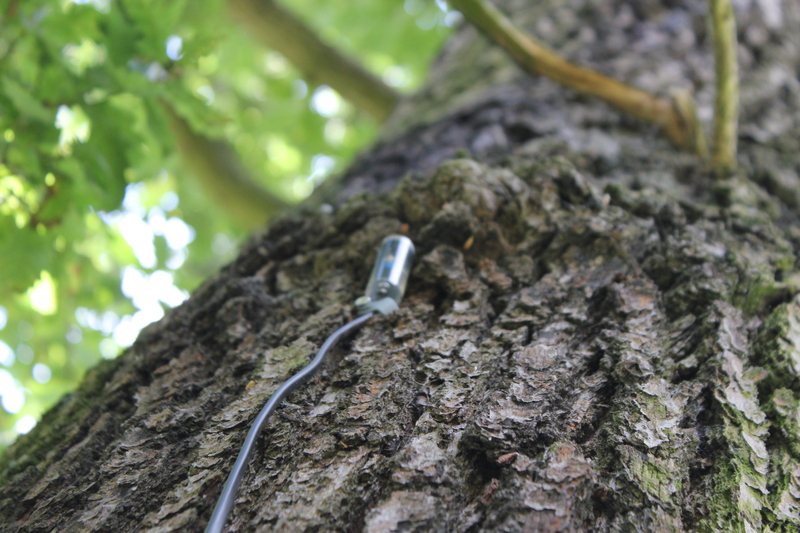 A transmitter embedded into the tree relays as fluctuating sound the trees reactions to light, via sensors on the tree and probes in the tree, which also relay its water levels as electronic tones. 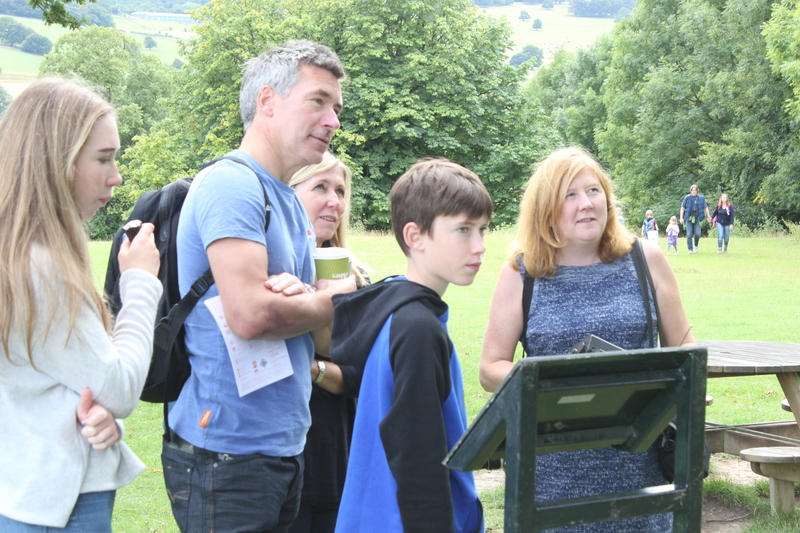 Visitors at YSP can pick up the trees transmissions on their personal FM devices (such as phones with FM) if they are standing next to or near the tree. 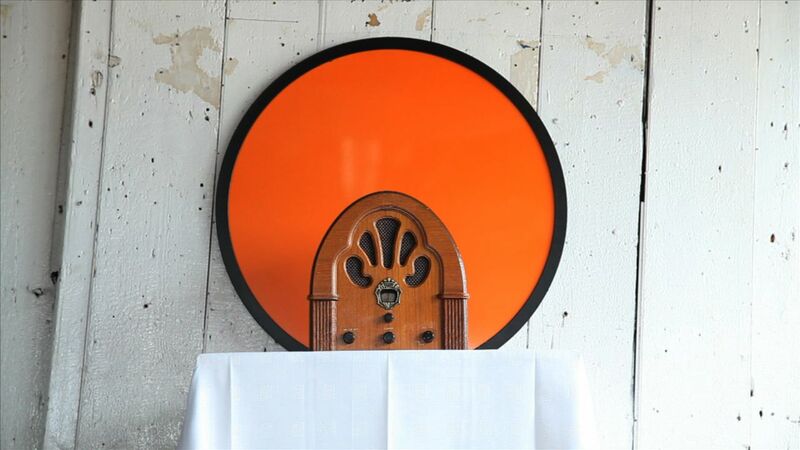 This work addresses issues surrounding the rate that new digital technology often becomes out-of-date, as it uses 100 year old tried and tested wireless technology. I have been working at the intersection between art and technology and this project takes forward my current interests. 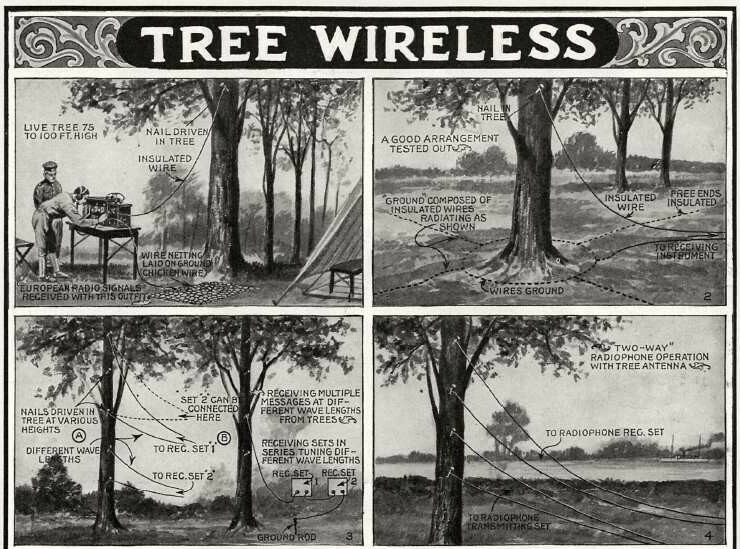 I wanted to make people think about trees and the root of all wireless technology: radio, and how simple and green it can be to use. Wireless, free and solar powered. 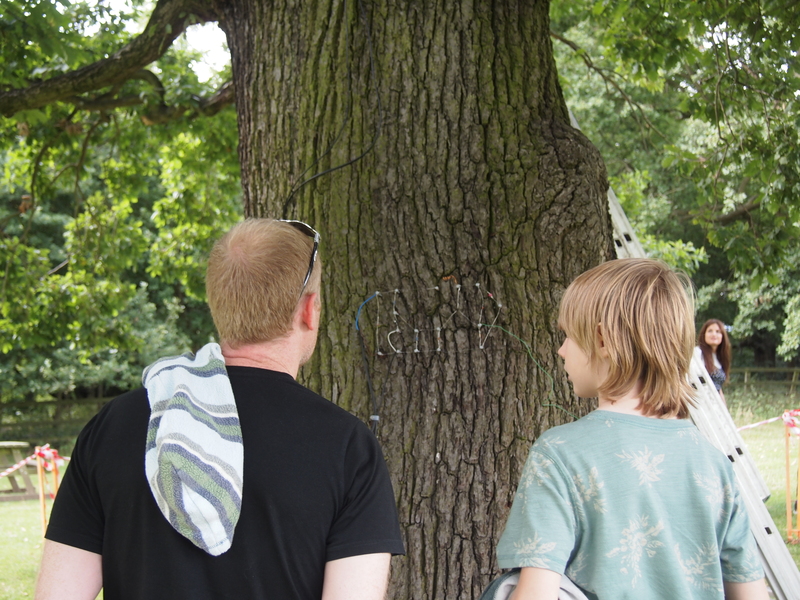 The tree transmitter reveals the hidden facets of organic tree life using simple FM wireless technology. 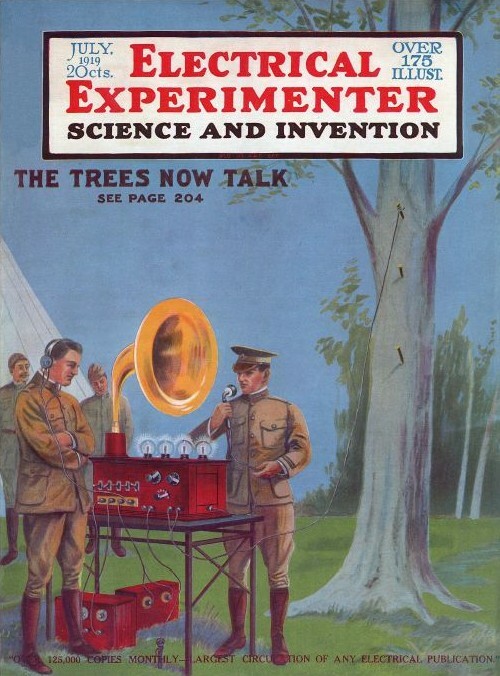 General George Owen Squire, the U.S. Army’s Chief Signal Officer and incidentally the inventor of Muzak, back in 1919, described how “[all] trees, of all kinds and all heights, growing anywhere—are nature’s own wireless towers and antenna combined.” He called this “talking through the trees.” He used trees as an antenna to pick up radio signals for the Army, I wanted to do the reverse use trees to send out a signal as radio and I loved the idea of actually hearing the trees talk. This project allows one to hear the tree responding to light and water as sound. 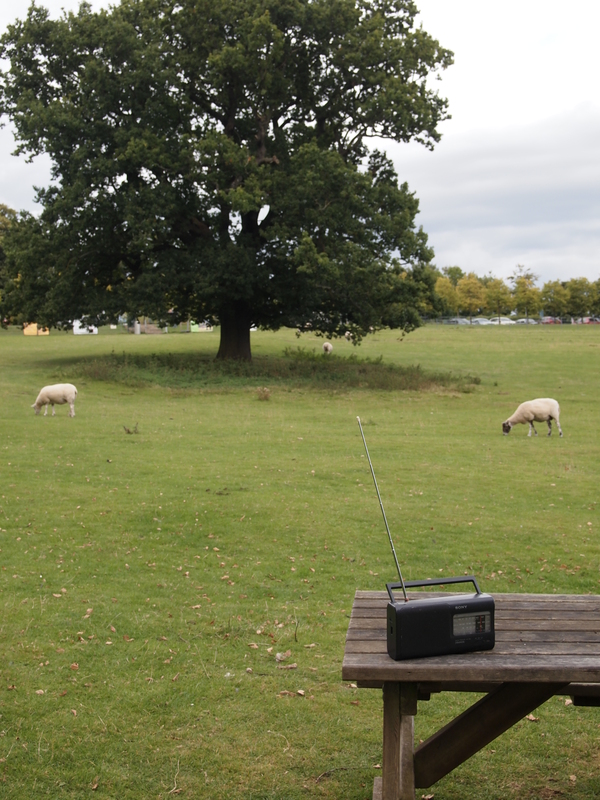 The project was kick started by an Art for the Environment residency awarded by UAL where I completed my PhD on radio art. For me this is just phase one of this research project which I plan to develop further. 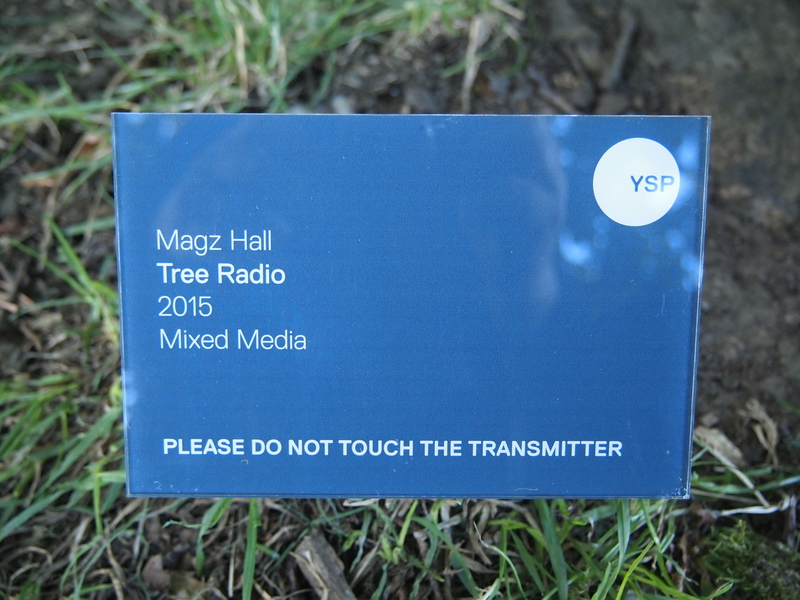 Tree Radio is currently exhibited at YSP until next year. Over the past year I have also been sharing my radio art research practice via Radio Arts workshops such as Reclaim the Waves earlier this year at the Tate Britain, a project exploring the changes to the lives of London residents over several decades, and Dream Vessels at the Turner Contemporary, where ceramic pots were used to transmit participants dreams. My first week at the Yorkshire Sculpture Park was fruitful. I made a test transmitter on part of a tree to get a handle on the size and what it would look like and I really love how the transmitter looks on the tree, it’s so simple and clean cut and really wish I could leave it like that, however moisture and rain will be an issue as it will easily flood the circuit, a week of unseasonal summer rain has highlighted how wet the trees get they soak a lot up water so my main issues is to think about how I can keep the wood to the back of the circuit dry. I’ve sourced some plastic, nails from a local Leeds manufacturer which can be used instead then I only have to think about keeping the front dry. The park suffers from meddlers I’m told (who can pull thinks apart even push over sculptures ) a reason I did consider putting a shield casing onto the outside to protect if from over zealous visitors and the elements. However I want to keep the water protection fitting to the eco nature to the project so have now opted to paint on resin instead as I want it to be simple and effective. The very present tree moisture will be good for the sensors Anthony Elliot has made for the project, one picks up the resistance from the tree via moisture in it the other reacts to the light from the tree. We tested them last week and they sounding great already so looking forward to hearing what they sound like on the tree. I found a fantastic site to for tree radio in a small wood of pine trees however once the sun finally came out I was concerned if there will be enough light for the solar panels, so lots to sort out in the next few weeks before I return. YSP are fantastic hosts its been great to get a behind the scenes understanding of the park and how it functions from all perspectives. Simon, James and Nathalie have been super supportive, so looking forward to getting this up and running later in the month. A very exciting if exhausting week, it was quite a challenge soldering outside and this has been a very ambitious project over just a few weeks so I am happy to report Tree Radio works. Which is quite a relief, I really hadn’t imagined how difficult cold wind could be on the tip of my soldering iron, but we managed to set up the tree radio installation, at the YSP site in a just a day, and it was extremely gratifying to hear it working on 100 FM this weekend a very clear signal was achieved. 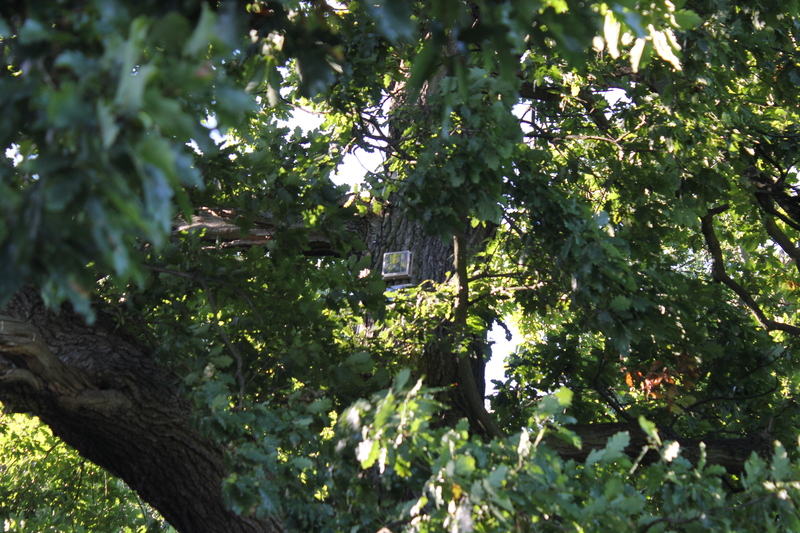 The problem now is how to keep the tree transmitter dry, the resin I hoped to protect the circuit from the elements proved to insulate and stop the circuit fully working after it had dried and sent the signal of the FM band. Also the plastic nails as one would imagine don’t conduct as well as I had hoped, the solar power was resilient as were the lovely sensors and resistance probes made by Anthony Elliott so far, more tests were needed to keep the transmitter dry and working full time and it will have to be cased in some form. But as you can see from the gallery how it was set it up and how great the site is looking and sounding. What is needed now is time to reflect, test further and work out the best strategy to keep it going long term on the site. The good news is Tree Radio is up and running for the next year at Yorkshire Sculpture Park we successfully housed another transmitter (same circuit design) in the tree in a waterproof box so it will be more robust, weather and outside conditions were basically affecting the outside trunk transmitter far too much and moving the frequency out of normal FM radio range and making it completely unstable in too many ways, further technical advise from Kent University confirmed my suspicions that the only way to move forward was to house it in a plastic box and with this set up its working really well again. We still need to monitor the solar power how long it will work and I will probably need to put more solar panels in the tree in the future to add to its longevity. 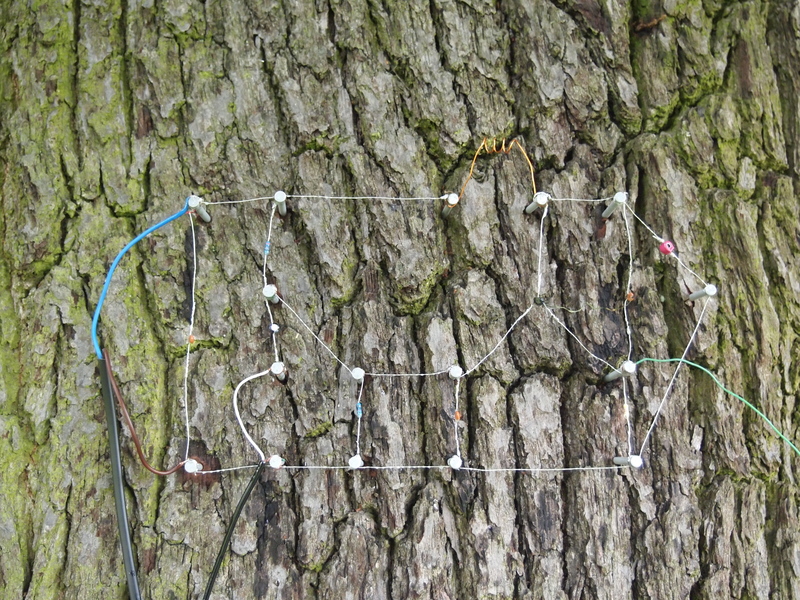 I am now looking to build a crystal transmitter which will lock the frequency so it can’t move around which it can at present, which would help stop it being affected by coldness and general weather conditions, as it was on the outside of the tree, but this has been such a useful experiment and project, the transmitter on the trunk will be left as a symbol and visual site for the process that is occurring higher up. 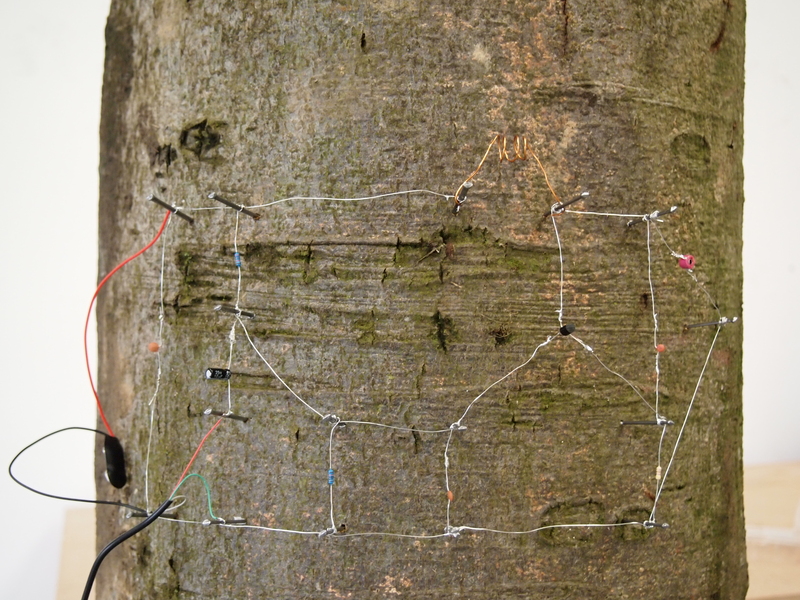 The light sensor and nail probes on the tree are also working well at present.